With multiple industry toolsets, AutoCAD lets us create anything we want. Our experts in CAD automation and have many years experience working with CAD systems. 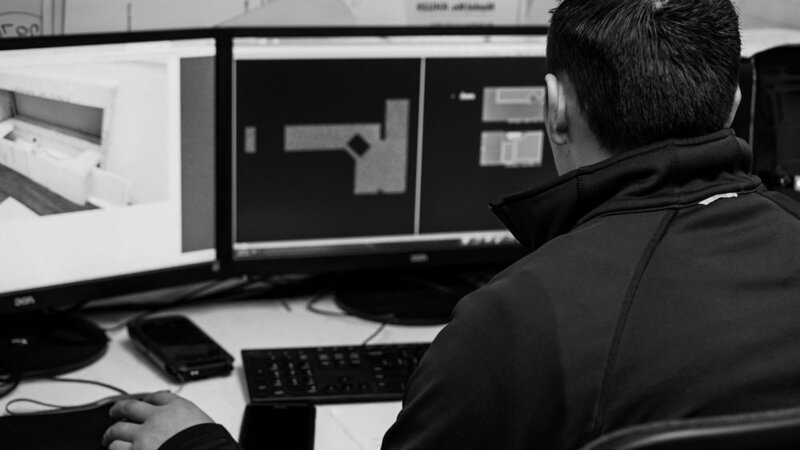 AutoCAD is computer-aided design (CAD) software that we rely on to create precise 2D and 3D drawings, that then will be sent out to our warehouse for cutting. AutoCAD includes industry-specific features and intelligent objects for architecture, mechanical engineering and design, perfect for our work environment. 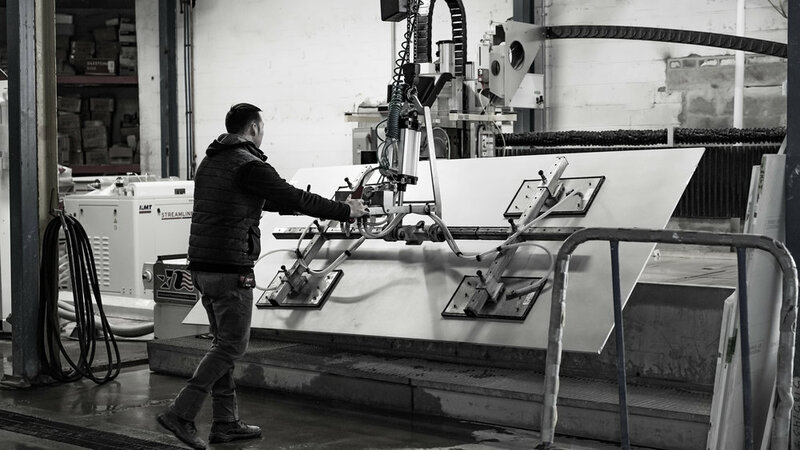 Slabsmith is a revolutionary new design-aid in the countertop process which allows a customer to see the final results of the stone installation before any material is cut. Slabsmith produces highly accurate digital slabs from physical slabs. Slabsmith digital slabs are true to life in both color and dimension and contain all relevant properties of the original slab. Slabsmith uses these digital slabs to provide benefits and advantages that include inventory management, 3D visual layout, sales and marketing tools, streamlined manufacturing, and targeted business decisions. In addition to seamless, high quality stone matching, we’ve integrated a robust inventory management tool that. Profiling, carving, tapering, kitchen tops, inlaying, milling, drilling, writing, grinding, aging, recess drain, water slots polishing, block side polishing. saw disc cutting, side carving, 3D modeling. One of these innovations is the machine control based on a commercial Windows 7 in order to grant ample connection and much easier use for the operator. The Master series work centers for processing stone offer highly advanced technical solutions. The extreme configurability of these machines make them ideal for the most diverse work environments granting reliability and maximum response to production requirements. Finally, you have the best of both worlds in one exclusive package. The current Generation 5 Sawjet is the result of refinement and perfection of the modern stone saw. Our Equipment, industry knowledge and experience on how to run an efficient all-digital stone shop. This includes utilizing equipment such as digital templating, inventory systems, part nesting via hi-resolution photos to achieve grain matching, barcode technology, graphical machine interface, CAD/CAM software to import directly from digital templates. 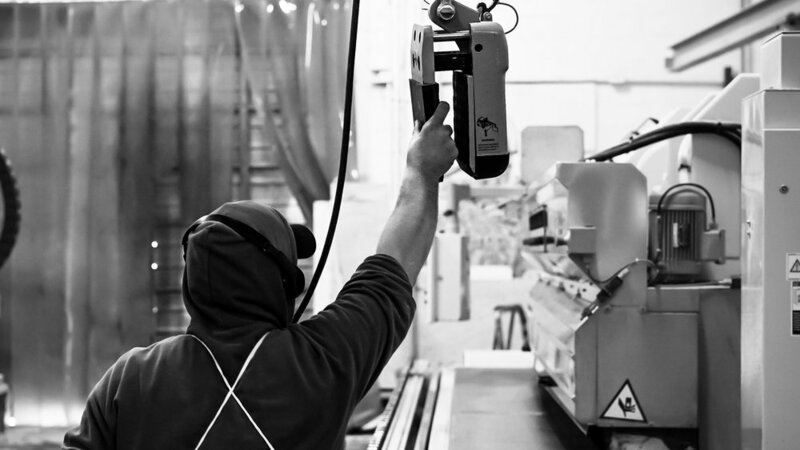 This means that Northwood not only delivers machinery, but they deliver the results necessary to move fabricators forward. 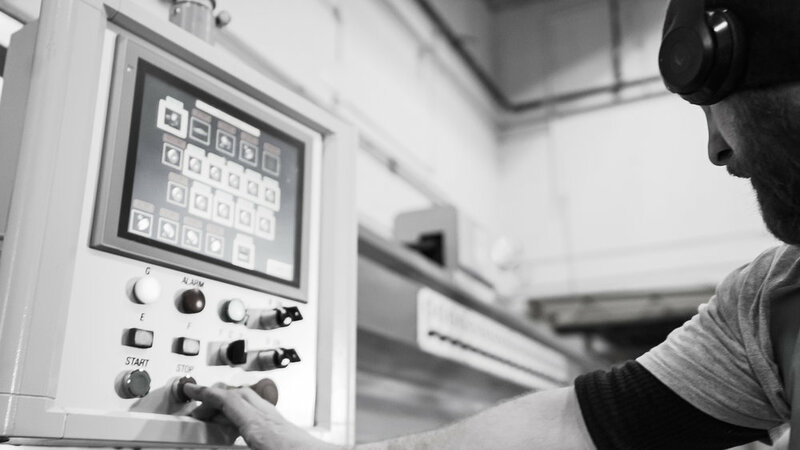 Rigidity and accuracy, this is what we expect from heavy machine companies we work with. 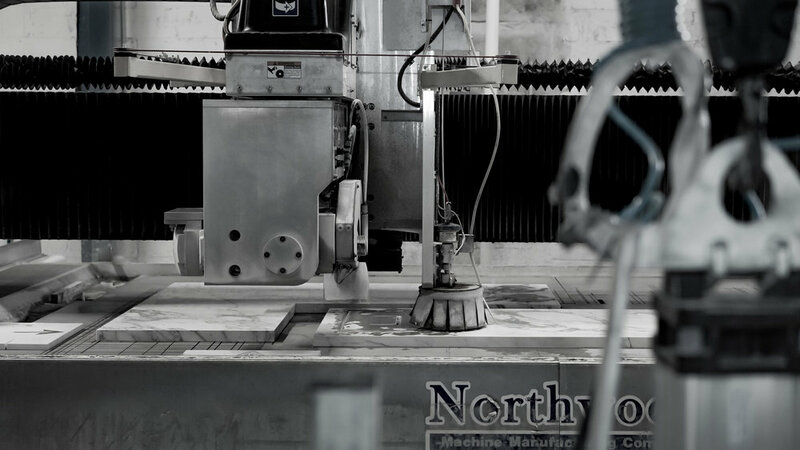 When we cut man-made materials most of the time, our natural such as granite or marble, our machines are fully capable of getting the job done. The iTEC technology makes programming and running our CNCs a dream. This intuitive barcode system is programmed specifically for the operation. Once scanned, the machine program automatically loads and production begin. Our shop is equipped in automotive semi-automatic bridge saws. 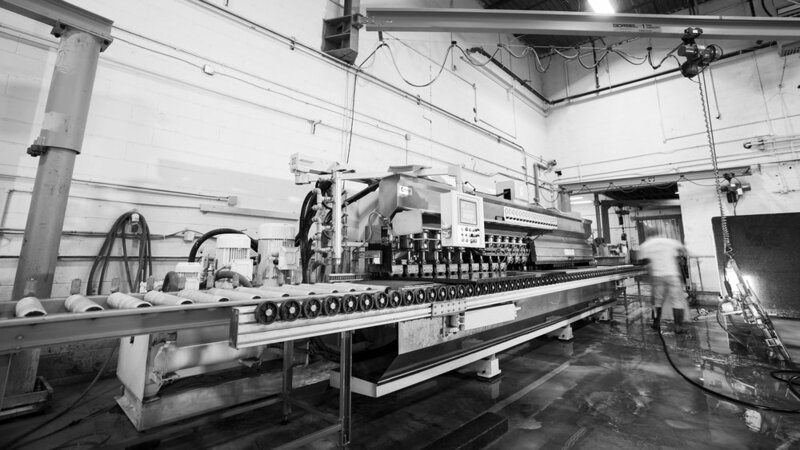 We take great pride in the quality and workmanship that is committed to each of our machines. 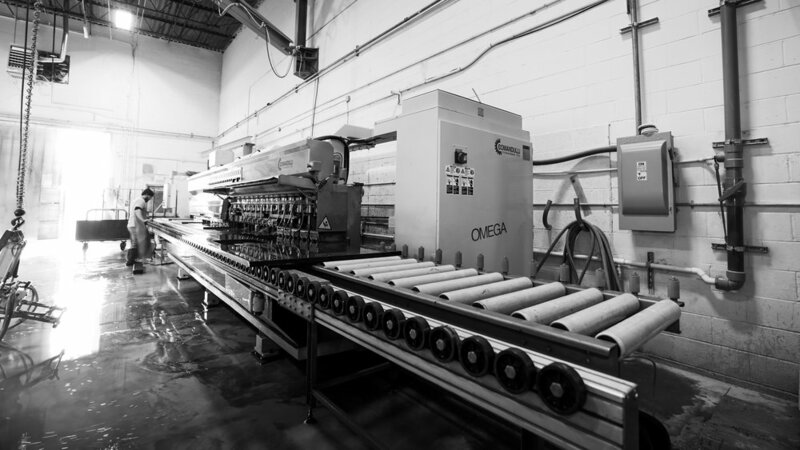 We use machines that are designed and built for maximum durability and high efficiency. 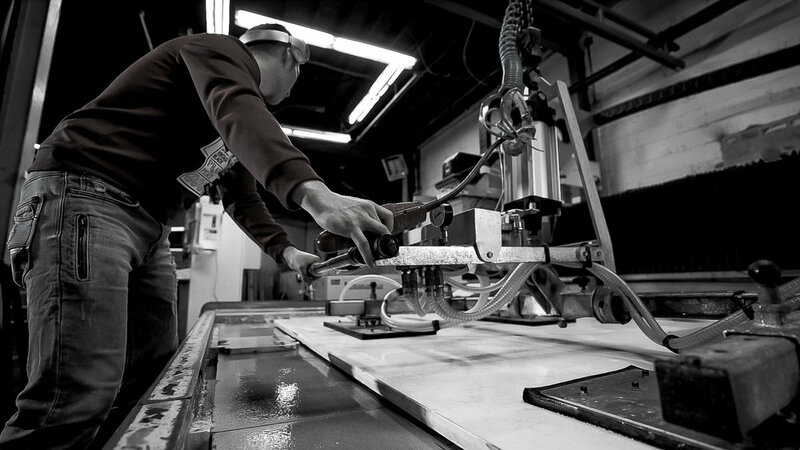 We provide high precision cuts, deliver sturdiness and accuracy. There is absolutely no room for error or downtime. CNC Machining Centers and SawJETs are used to produce countertops made of 2cm and 3cm granite, quartz, marble engineered stones, and other natural stones. These machines are high-torque SmartSaw with PowerTilt for mitered cuts/edges as well as high-pressure CNC waterjet equipment. In fact, we combine the two technologies and makes cutting any nest that is set up for yield or beautiful part matching an easy job. 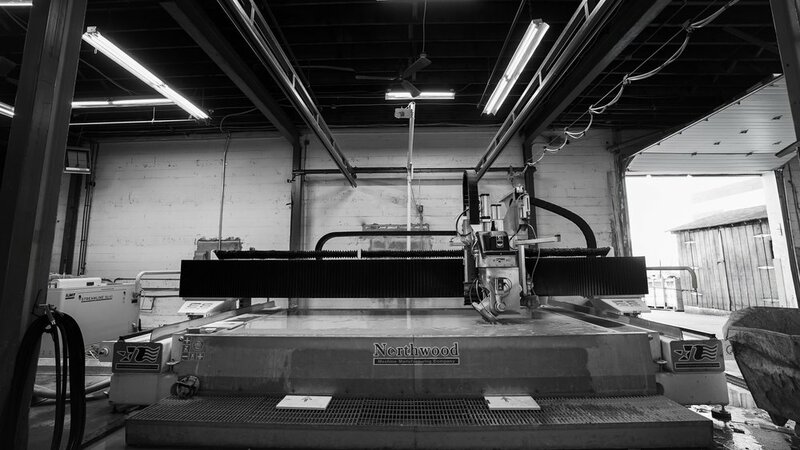 The Legendary Northwood or Breton Machines are capable of performing edging, profiling, and machining of countertops using any available CNC cutting tool. 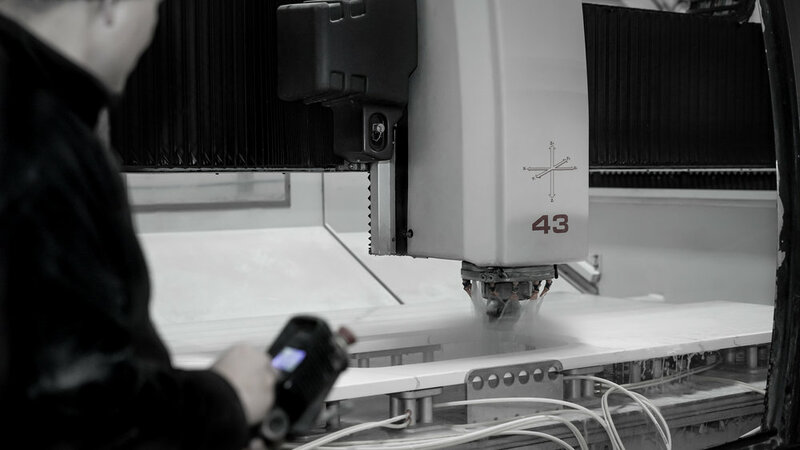 The EDS router is also capable of extremely high-torque at very low RPMs making it the ONLY CNC Stone Router in the industry capable of performing CNC texturing, brushing, honing, leathering, and polishing of different stones. Combining precision craftsmanship and a compact design, along with the durability and performance. The result delivers unrivaled speed and productivity, even for today’s most demanding and sought after designs. Of course, the Omega Pencil also offers more traditional profiles such as straight, edge, round, bullnose, shark nose, half, and quarter bullnose — all at the same exceptional quality and speed. Designed and manufactured according to the up-to-date concepts and structural principles, the OMEGA series, automatic multispindle belt polishing machine, is remarkable for its performance and production on every kind of marble and granite. 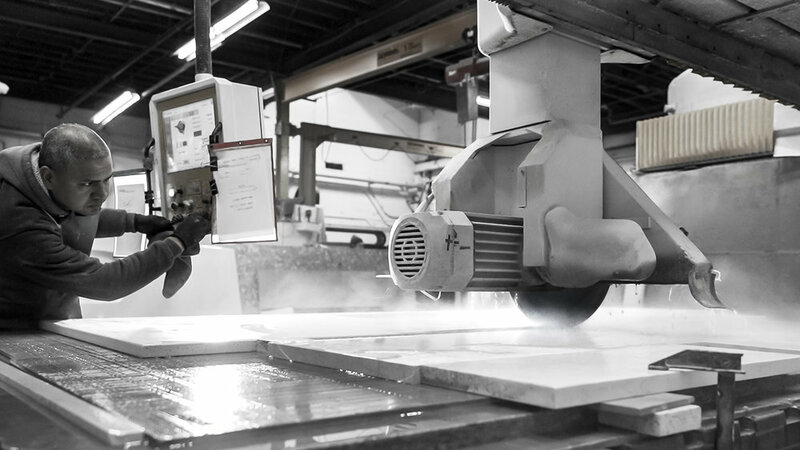 Its complete equipment allows it to perform all the finishing operations on the materials used in the building field, furnishings, and monuments. This machine is able to perform: straight edge, bevels, upper groove, lower groove, sloping cuts, and their polishing, quirk miters (QM), slot cuts in general, bullnose, edges with regular round shapes (quarter bullnose, half bullnose, etc…). All our machines are protected against corrosion through a modern treatment that follows different phases: sandblasting, metallization and painting The painted covers are subject to cataphoresis treatment, crates in stainless steel. We have the possibility of polishing straight edges on slabs of different thickness.